Has there ever been a better time to take a break from Bangkok? We didn't think so. Please join director Bradley Cox for the Asia premiere of Who Killed Chea Vichea? And then you can hit the beach! The Phnom Penh Post takes on a question we've been wondering about: On what basis did the Cambodian authorities stop the unions' May Day screening of Who Killed Chea Vichea? Phnom Penh officials ... demanded that organisers obtain approval from “relevant ministries” that was never granted. The Ministry of Culture and Fine Arts stated that it must approve all films screened in Cambodia. “If it is for public screening. It must have permission from the ministry.” He said that any foreign film must be imported by a Cambodian company holding the rights to bring in films from abroad. Tith Sothea, spokesman for the Press and Quick Reaction Unit at the Council of Ministers, said that the government had the right to block screenings of the film wherever they are held if organisers have not sought government permission. “Any media that is produced or imported illegally, the authorities have the right to confiscate it every time." Ou Virak, president of the Cambodian Center for Human Rights, points out that other organizations regularly screen films in public without asking the Ministry of Culture for permission. This could include the frequent screenings of foreign movies at the Foreign Correspondents Club and the Centre Culturel Français -- along with the countless thousands of bootleg DVDs that are openly on sale in Phnom Penh's public markets. The answer to the question posed in the headline seems to be "anybody and everybody in the government, according to rules that they make up as they go along." Justice delayed is justice denied. It's normally intended as a cautionary maxim. In Cambodia, it's more like tactical advice. The unions intended their May Day screening of Who Killed Chea Vichea? to pressure the government to investigate the murder, which took place in 2004, and find justice. But the screening was stopped by the police. 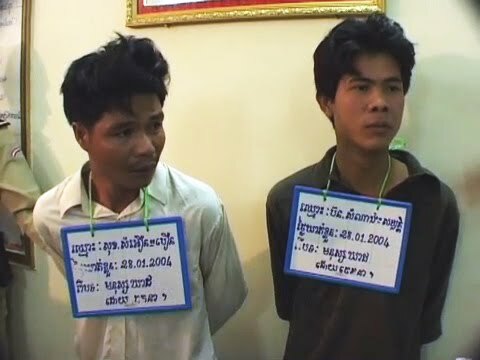 Government officials have said they will not investigate the murder further until two suspects, Born Samnang and Sok Samoeun, are officially cleared by the courts. In Cambodia, it's the duty of the court to carry out the investigation. But the court has only investigated Samnang and Sam Oeun, and none too well at that. The result: By focusing on them, the court has effectively chosen to avoid the facts surrounding the crime itself. The evidence. The witnesses. The motives. For over six years it's been delay, and deny. Samnang and Sam Oeun were provisionally released over a year ago by order of the Supreme Court, which told the Appeals Court to reinvestigate the case. That's what they're doing now, they say. Still, it remains an investigation into who didn't kill Chea Vichea rather than who did. Until the Appeals Court retries them, Samnang and Sam Oeun can't possibly be cleared--and until they are cleared, there won't be an investigation of who killed Chea Vichea. Other than ours. Cambodian workers who hoped to see Who Killed Chea Vichea? on International Labor Day didn't get so much as a bite of popcorn before police intervened and tore down the screen. The workers' march arrived at the screening site, in front of the newsstand where Vichea was killed, around 5:00pm. They were met by a force of riot police, as well as local officials and a large group of other men not in uniform, presumably plainclothes security forces. The organizers went ahead and erected the screen, which was made out of sheets. 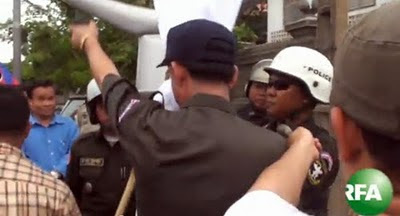 The police immediately told the main organizer, Rong Chhun of the union confederation, to take it down as he did not have a permit. When he refused, they pushed in and pulled it down. Mr Chhun returned with a second screen, accompanied by opposition members of parliament, but that screen too was seized. The workers resisted only briefly. "We did not want to have a big scene as we were outnumbered," said one participant. "They were there to break down anything and for sure it would have been real force had we resisted and shown the movie." So far there are no reports of any arrests or injuries. Our thoughts and hopes are with the Cambodian people today.